20:30 - Angelo is also Evicted from the Chase. 20:15 - Bimp is Evicted from the House. 20:00 - The eviction show has started. We will be saying goodbye to 2 Housmates tonight. It could be Namibia's Dillish, Angelo from South Africa or Ethiopian Housemate Bimp. 19:00 - Elikem speaks out about putting Angelo up for possible Eviction this week. "Angelo is one of the people I'd like to see leave with the money if not me. In anyway, I don't really care right now if he takes it personal and doesn't talk to me for the rest of his life". 18:45 - Eviction Diary sessions commence with Bimp who says he has been Chasing a better tomorrow. His last words are "one love, one blood, one Africa." 18:10 - "I'm so nervous, I can'teat properly man," Dillish declares. Elikem says she might not be leaving tonight. "But if it's two people going I'm in trouble," Dillish adds. 17:30 - Cleo is sitting in bed, sewing some white motifs onto her black bra. 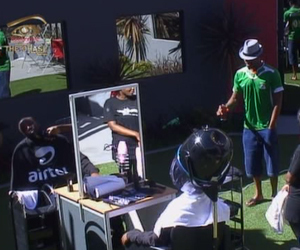 17:00 - Beverly helps Bimp spruce up his look for tonight while HoH Elikem irons Dillish's dress. 16:15 - Dillish seems to be super nervous about the Evictions and can't even eat. 15:30 - Bimp watched as Beverly washes her hair in the sink. "I was tired of that hair," she tells him. 14:10 - Cleo plays hairdresser and helps Beverly to undo her weave. 13:49 - Elikem and Melvin play chef and cook a big Sunday lunch for their fellow Chasemates. 13:15 - Its the final shopping spree of the season! The Housemates have exactly a week to go before the eagerly anticipated Finale! 12:46 - Bimp and Melvin remind Dillish and Cleo of their drunken shenanigans last night. 12:15 - Angelo and Beverly steal some alone time and decide to read the Bible together. 11:20 - Bimp, Angelo and Melvin rally around Dillish and want to see what she'll do with her hair. "I hope you're going blonde this week. We're all sitting here waiting for you to finish," Angelo says. 10:30 - The hairstylists descend on the House. Dillish is super excited. "Do whatever you want do with me. I'm ready for whatever," she tells one of the hair dressers. 10:00 - The Housemates have their breakfast after waking up earlier than normal. It would seem Eviction stress has them by the neck. can c the money is that of elikem or melvin.elikem is very happy now cus angelo was a threat to him.lets c if u have the money.